No Jamaal Charles, no problem in the Kansas City Chiefs backfield, right? Maybe not after the first week of preseason action, as the Chiefs RB corps did not fare too well, in fact on just eight snaps at quarterback Alex Smith led the way with one carry for 10 yards in a 27-17 loss to the San Francisco 49ers. Rookie QB Patrick Mahomes tossed his first touchdown pass in his debut for the Chiefs, yet the Kansas City offense gained just 187 total yards. Rookie QB C.J. Beathard put together an impressive stat line while fellow rookie Joe Williams from Utah looked very sharp for San Francisco on Friday night, as did No. 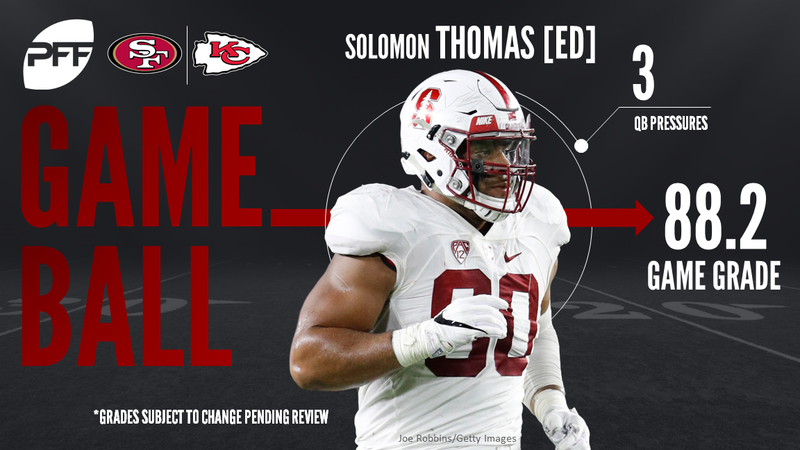 3 overall pick of this past NFL draft, Solomon Thomas. With that, we refocus and give you our PFF exclusive takeaways from the contest for each team. Bourne, an undrafted player out of Eastern Washington, showed that his success at the FCS level may transfer to a higher level as well. Bourne caught four of his seven targets for 88 yards and a touchdown on a play when his primary defender in coverage fell down. When Bourne was targeted Friday night, his quarterback’s passer ratings was 141.4. After being a lesser part of Kyle Shanahan’s offenses in Washington and Atlanta, most recently, Robinson has a real chance to make a name for himself as an offensive contributor for the 49ers. Robinson had one of the highlights of the night with a 63-yard reception, 50 of which came after the catch. Robinson finished with a receiving grade of 81.0, playing in the first half against player more likely to make an NFL roster. The rookie third overall pick started his NFL career with a bang as he recorded a hit and two hurries on 20 pass-rush snaps while also showing his stout run stopping ability notching two run stops on just seven run snaps. Thomas was able to consistently push the pocket whether rushing from the edge (9 snaps), over the tackle (8 snaps), or the interior (3 snaps). While veteran edge rusher Aaron Lynch had a bigger impact on fewer snaps recording two sacks and a batted pass, Foster’s debut in the NFL was also excellent as he showed his coverage instincts in breaking up a would be touchdown on the opening drive of the game. Allowed a catch on the other pass he was targeted on but made an immediate tackle for just three yards. He fielded a game-high 86.8 coverage grade, topping all defenders at any position in the contest. In his first NFL action, Patrick Mahomes showcased some of the good that made the Kansas City Chiefs traded up 17 spots in the first round of the 2017 draft. On his very first play, he showed veteran ability to look off the free safety and throw to the open outside wide receiver on the opposite side, albeit slightly underthrown and called back because of a hold. He misfired on just one of his nine attempts while the other incompletion was a miscommunication. He finished the night with a very respectable 77.8 percent adjusted completion percentage. Duvernay-Tardif kep the pocket clean on 15 pass blocking snaps while dominating on just four run blocks where he scored a pancake block on Spencer Ware’s touchdown run on the opening series of the game. Duvernay-Tardif notched a game-high 83.2 run block grade. After bouncing around the league for the past few seasons, after being drafted in the seventh round by the Bengals in 2013, King faces an uphill battle to make the Chiefs roster that is stacked with defensive line depth. But King made a good impression on Friday night with one sack, one hit and two run stops. King’s pass-rush grade of 80.4 was second highest on the team and also posted a solid run defense grade of 76.6. Okine also has bounced around the NFL since coming out of Florida in 2013. He was a steady presence late in the game for the Chiefs on Friday night though. Okine was especially disruptive in run defense, recording three stops and posting a team-high run defense grade of 90.2.